Three million dollars’ worth of art and $10,000 crystal-encrusted bar stools… You’d be forgiven for thinking I was about to describe a luxury art gallery in New York. One thousand thread count Egyptian bedding, Bulragi toiletries, camomile-infused mattresses and a choice of 12 pillow types for an indulgently restful night’s sleep… A luxury hotel in Singapore perhaps? A Master Chef who has worked for French President General de Gaulle, Versace dinner plates, private vintage wine and gourmet fare pairings… An exclusive Parisian dining establishment maybe? 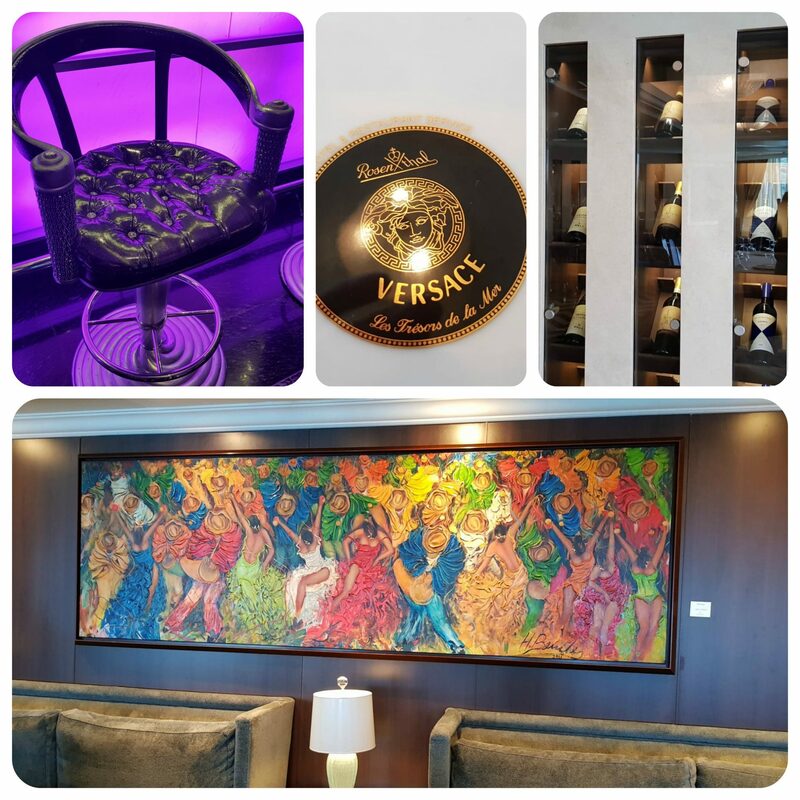 Actually, these features make up just a small amount of what’s on offer aboard Oceania’s fabulous Marina ship which I had the pleasure of visiting this week. Reading some of these accolades may go a little way to understanding why the budget for building this ship went over by a cool $200 million! I would say sack the designer, but the result is well worth the overspend! Despite the huge expense, everything onboard is tasteful and understated. Even the $250,000 vase and table between the twin grand staircases isn’t screaming ‘look at me’ in a brash or brazen way. In a way, the ship reminds me of Diana. She didn’t need to shout about her good looks and she wore her jewels elegantly, without the need to show off. The Finest Cuisine at Sea is a bold statement to make, but Oceania relish in being the foodie’s cruise line. And they’re in good hands with Jacques Pépin as the Culinary Director. Jacques, a rustic French restaurant on board named after the same, is said to be a firm favourite among British guests… Save yourself for the cheese course, it’s to die for! Wine connoisseurs will be salivating over the wine pairings on offer at La Reserve; and with seating for just 24 people you’ll never be left parched. 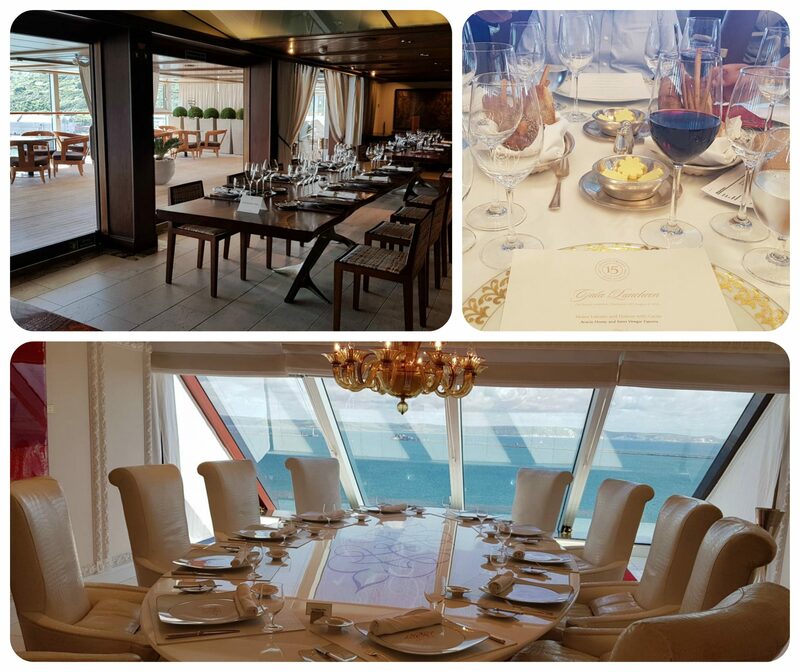 If you’re looking for something really extra special then Privée is a beautifully intimate space at the aft of the ship, set for just 10 people. I loved the natural light and beautiful white furnishings used in this space. Often people are put off by larger ships, however this one has half the number of passengers in the same amount of space as other liners, ensuring it never feels crowded or chaotic. There is only one announcement a day and a very serene time can be enjoyed by all, be it encouraging your inner creative flair with the resident artist, taking part in the highly popular knife-skills culinary class, relaxing in one of the on-deck hot tubs, taking in a show or reading in the library… The choices go on. There is a myriad of itineraries on offer with Oceania Cruises, from the plains of Patagonia to the cultural mysteries of the Far East. Or why not take in everything on the iconic « Around the World in 180 Days » cruise! For more information on Oceania Marina, its smaller cruise ships and to book your next cruise, please do get in touch. 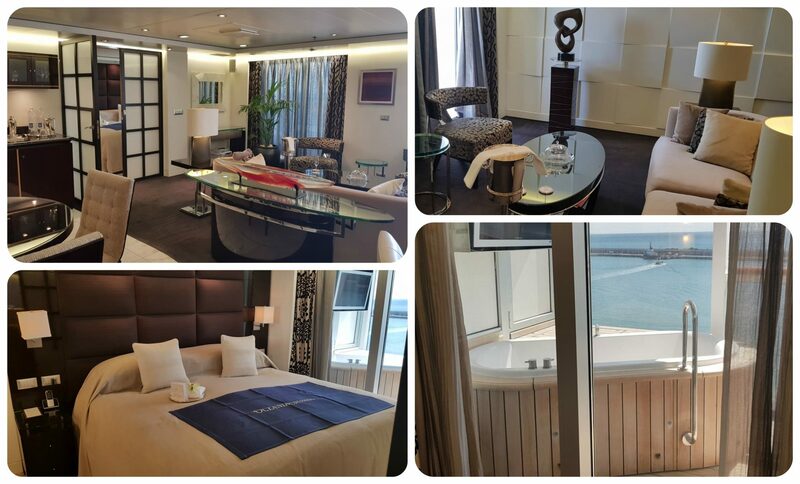 Having personally experienced the staterooms we’ll be sure to find a cabin grade to meet your requirements and tell you about upgrades which bring maximum extras for very little cost. Think private in-suite cinema rooms, canapés brought to your room mid-afternoon, relaxing in your outdoor bathtub, choosing your outfit from the walk-in wardrobe… There is something for everyone! 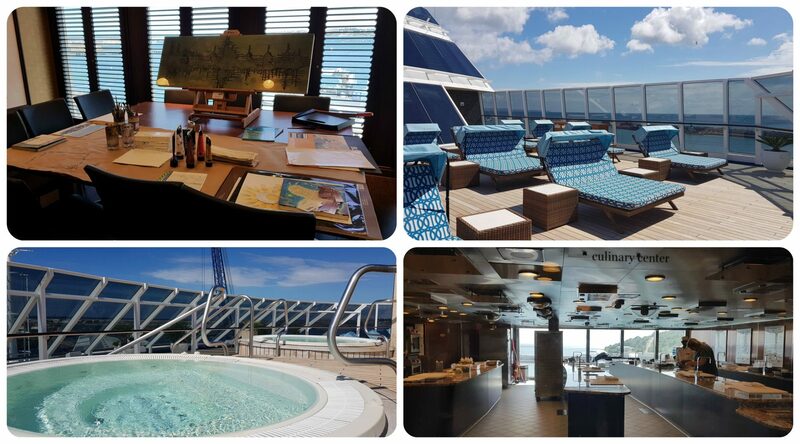 All photos taken by Emma on board.